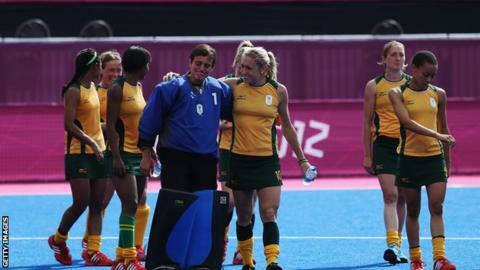 South Africa's men's and women's hockey teams have been prevented from competing at Rio 2016, by their country's Olympic committee (SASCOC). The South African Hockey Association (SAHA) says the decision will "cripple the sport" in the country. It believes the teams met the qualification criteria by winning the African Championships. But the Olympic committee wanted them to qualify via the Hockey World League, which they failed to do. It will be the first time in 20 years that they will not participate at a Games. SASCOC and the SAHA signed an agreement earlier in the year which stated qualification could only be gained via the World Hockey League and had to be achieved by 5 July. The men's team - ranked 15th in the world - were eliminated in the second round, while the women's team - ranked 11th - reached the semi-finals of the third round, where they lost to Great Britain. SASCOC said the decision is in line with their policy of "producing world-class athletes who will compete at the highest levels." The association - who confirmed the news on Friday - said it signed the agreement as a "fait accompli", adding the criteria proposed was "unachievable". It added in a statement: "The decision taken is by no measure in the interest of the sport."